How much time do you spend digging through your work files and emails to find all those little pieces of information you need? Southern Farm Bureau has cut out time-consuming activities by bringing together information on a secure, digital portal—boosting efficiency and helping its people work more productively than ever. 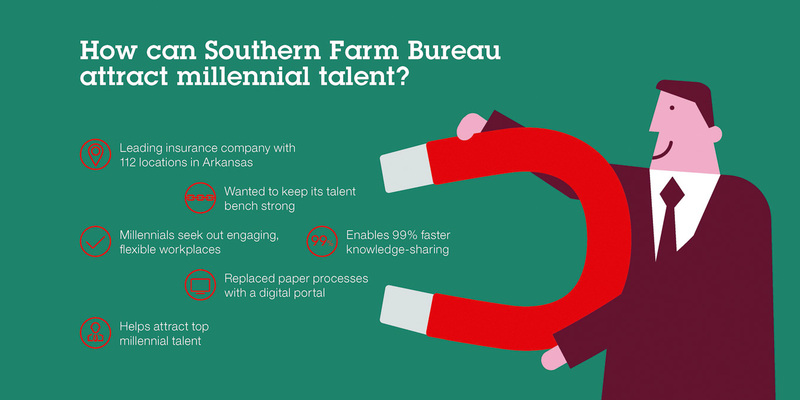 To boost competitiveness, the Arkansas division of Southern Farm Bureau wanted to employ talented millennials—but some of its siloed, paper-based ways of working were a turn-off for younger employees. Southern Farm Bureau is creating a truly digital workplace, enabling employees at locations across the state to meet, share and discuss information on a secure portal tailored to their unique role. Consumer expectations in the insurance space are evolving rapidly. Increasingly, customers are demanding a more responsive, personalized experience that matches the speed and convenience of services like digital banking. And it’s not just customer expectations that are changing: employees are becoming more demanding too. Millennials are seeking out employers who can provide flexible, engaging, social, digital working environments—and to hire and retain top talent, meeting these expectations is a must. Bobby Wood, Senior Network Administrator at Southern Farm Bureau Casualty Insurance Company, takes up the story: “In the coming years, we aim to develop and deliver innovative, data-driven services that enable customers to compare, renew and manage their products seamlessly online. In the past, Southern Farm Bureau relied heavily on a static intranet for knowledge management, and paper-based processes to drive its day-to-day operations. This made it difficult for teams to work together or share knowledge and ideas, particularly if they were not working at the same location. “In addition to our state office, we have 112 county locations across the state,” Wood continues. “Our people worked in silos, and there was limited interaction between different offices and departments. “This way of working presented a number of challenges. Our intranet was around a decade old, and any changes had to be submitted to the IT team, who would update the content manually in HTML. Because the process could take as long as three weeks, people were reluctant to request changes, and it was practically impossible to ensure that all of the information was accurate and up to date. “Finding information on the intranet was a time-consuming process too, both for experienced employees and new joiners. For example, the procedures manual that our underwriters frequently refer to was buried 14 clicks deep in the page hierarchy. There were around 15 legacy copies of the manual across the network—increasing the risk of employees retrieving an outdated version. Today, Southern Farm Bureau has replaced its static intranet with a dynamic digital workplace. Combined with enterprise collaboration tools such as digital communities, wikis, instant messaging and more, the new employee portal is helping all parts of the business work together much more effectively. Making changes to the content on the portal is now a straightforward process that employees can complete themselves, without assistance from IT. Self-service capabilities have cut the time it takes to publish new content from over a week to a few hours, which helps ensure that the information on the digital workplace is relevant and up to date. Fresh content also ensures that employees come back often to get the information they need, when they need it. By embracing its digital transformation, Southern Farm Bureau is bringing employees together more closely than ever. By re-imagining its business processes with collaboration at the center, Southern Farm Bureau is building an engaging digital workplace that will encourage top talent—especially from the millennial generation—to see the company as an employer of choice. “When new people join the business, we put all the information they need to excel in their role right at their fingertips,” says Wood. “For example, our IT team sees real-time status updates on the health of our network and storage systems directly in the portal, which means we can respond faster to remediate potential issues and maximize availability for our business systems. Thanks to the company’s centralized approach to information management, employees can also disseminate knowledge faster. He adds: “Previously, employees would often share documents via email—for example, when the time came to send out various forms at the end of the year. When 1,000 people in the business are all emailing the same 1MB file, the pressure on storage starts to pile up quickly, and our portal has been a major factor in reducing that burden. With digital communities at the heart of day-to-day work at Southern Farm Bureau, employees can share updates more quickly and effectively. Using communities reduces the amount of time people need to spend in face-to-face meetings, and helps employees to keep projects on track. “We are now well established on our digital transformation, and already planning for the future,” says Wood. “In the medium term, our goal is to migrate all documents to the portal, which will eliminate the need for employees to swivel between network drives and the portal to get the files they need. Located in Little Rock, Arkansas and employing/contracting more than 1,000 people, the Arkansas division of Southern Farm Bureau Casualty Insurance Company provides competitive policies and services to meet the needs of its members and policyholders across the state. © Copyright IBM Corporation 2017. IBM Corporation, 1 New Orchard Road, Armonk, New York 10504-1722 United States. Produced in the United States of America, April 2017. IBM, the IBM logo, ibm.com, Connections, and WebSphere are trademarks of International Business Machines Corp., registered in many jurisdictions worldwide. Other product and service names might be trademarks of IBM or other companies. A current list of IBM trademarks is available on the web at “Copyright and trademark information” at ibm.com/legal/copytrade.shtml. This document is current as of the initial date of publication and may be changed by IBM at any time. Not all offerings are available in every country in which IBM operates. THE INFORMATION IN THIS DOCUMENT IS PROVIDED “AS IS” WITHOUT ANY WARRANTY, EXPRESS OR IMPLIED, INCLUDING WITHOUT ANY WARRANTIES OF MERCHANTABILITY, FITNESS FOR A PARTICULAR PURPOSE AND ANY WARRANTY OR CONDITION OF NON-INFRINGEMENT. IBM products are warranted according to the terms and conditions of the agreements under which they are provided.